This card, for my sister-in-law, was inspired by a magazine article. It didn’t quite go according to plan because it was supposed to be a one-layer card, similar to the one by Chrissie Stokes on page 22 of the July 2012 issue of Craft Stamper. I can’t believe I’ve never found Chrissie’s blog before but I’ll be a regular visitor from now on! Anyway, back to the card. 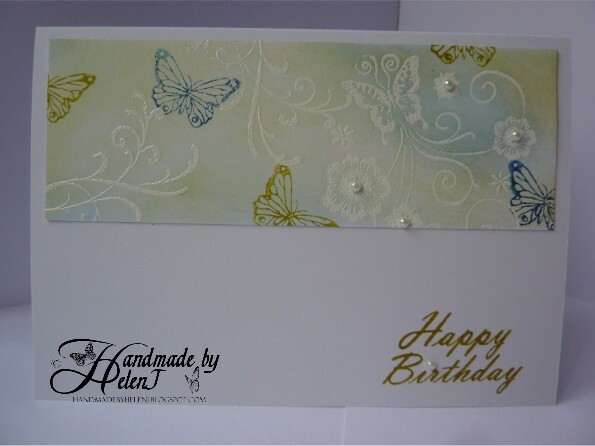 I stamped the flourishes & butterflies with Versamark & embossed them with Cosmic Shimmer white embossing powder. Then I used ink dusters to brush on Adirondack Denim & Lettuce inks, then stamped more butterflies in the same colours. The mistake I made was in using low tack masking tape to mask off the area I wanted to stamp; it wasn’t low tack enough & took off some of the top layer of the card. Also some of the ink seeped under the tape and resulted in blurry edges. I didn’t want to waste it so I trimmed & mounted it on a new card blank. 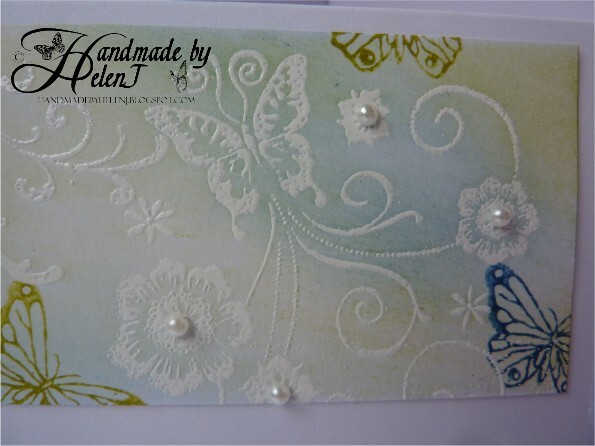 A few flat backed pearls, a stamped greeting, and it was done. 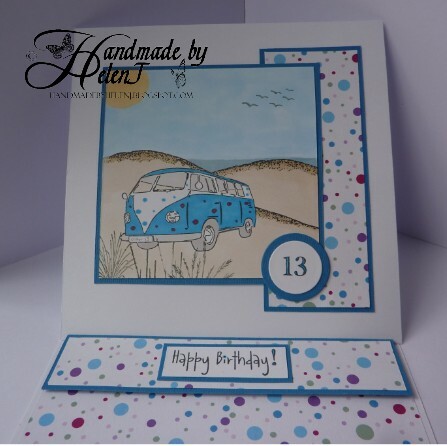 One of my son’s friends celebrated his 13th birthday recently; he’s mad on camper vans & is known as Camper Van Dan in our house! 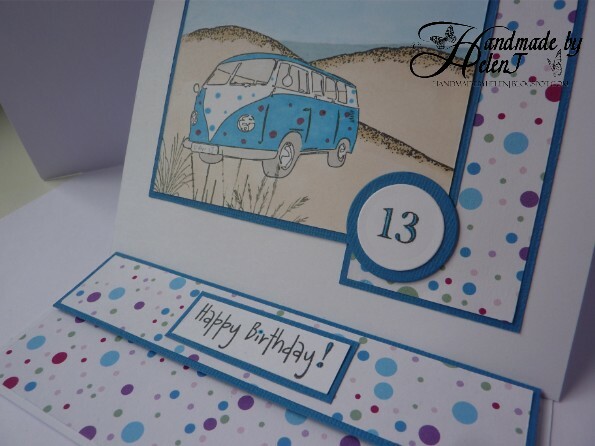 When I saw this Papermania camper van stamp (part of the Urban Stamps range) I bought it with him in mind. 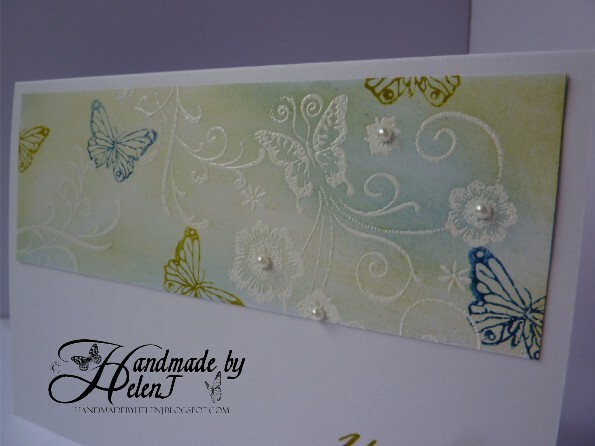 I’ve stamped & masked it then used Inkylicious Seascape Memories stamps to create the background scene. All the colouring was done with Promarkers. I spent ages trying unsuccessfully to create a sky and white fluffy clouds until I just gave up & coloured the sky with what I thought was going to be a solid blue colour. However when it dried I really liked the effect – a happy accident! 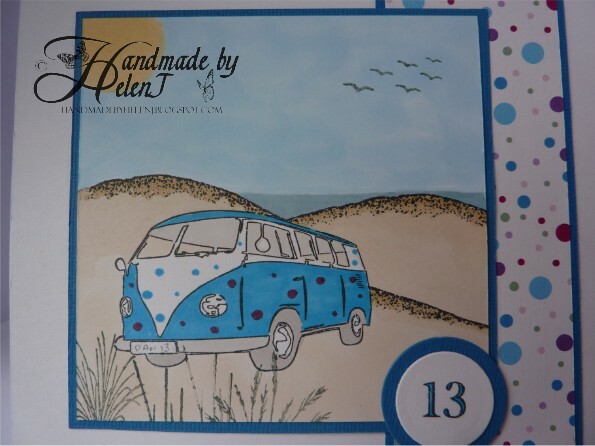 I coloured the van to match the backing paper which is from my stash. Stamps by Inkylicious (Seascape Memories) & Papermania (PMA 907126), greeting stamp by Elzybells (no longer available), number stamps by Kirsty Wiseman for Personal Impressions (PICSA6274). In complete contrast to the last card I posted, this is unashamedly girlie. The papers are gorgeous, they’re all by SEI who I’d never heard of until recently. The plain pink & cream papers feel like suede but they’re really easy to cut & work with. The ribbon was plain white but I coloured it to match using Promarkers with a diamante buckle from Meiflower. The numbers were plain chipboard, painted with white acrylic paint and coloured with Promarkers. I then used Anita’s Clear Gloss to finish them off. Along with 2 of my friends, I celebrate a milestone birthday this week. This card is for a friend from work whose birthday is tomorrow. He’s 3 days older than me, and I never let him forget it! The numbers were created in the Silhouette software then cut on my Craft Robo Lite using Papermania Capsule Collection Textured Premium cardstock. The backing paper was from a digikit in Craft Artist Professional which I recoloured using the software, the words were also created in CAP and coloured to match. I wasn’t very happy with the base card, which uses the same cardstock as the numbers. Although it was great for cutting on the Robo, it’s not strong enough for a base card but as I didn’t have any other black cardstock I had to make do. Cardstock Papermania Capsule Collection Textured Premium, Dawn Bibby brads. It’s been a while . . . .
. . . since I last posted, but also since I got married! Tomorrow marks 24 years since my husband & I got married. The inspiration for this card was from something I saw on the web but unfortunately I didn’t save the link to it. The words & hearts in the bottom corner were created in Craft Artist Professional, then I stamped the different sized hearts using Brilliance Pearlescent Poppy and added a few confetti hearts for some understated bling (my other half doesn’t do bling!) 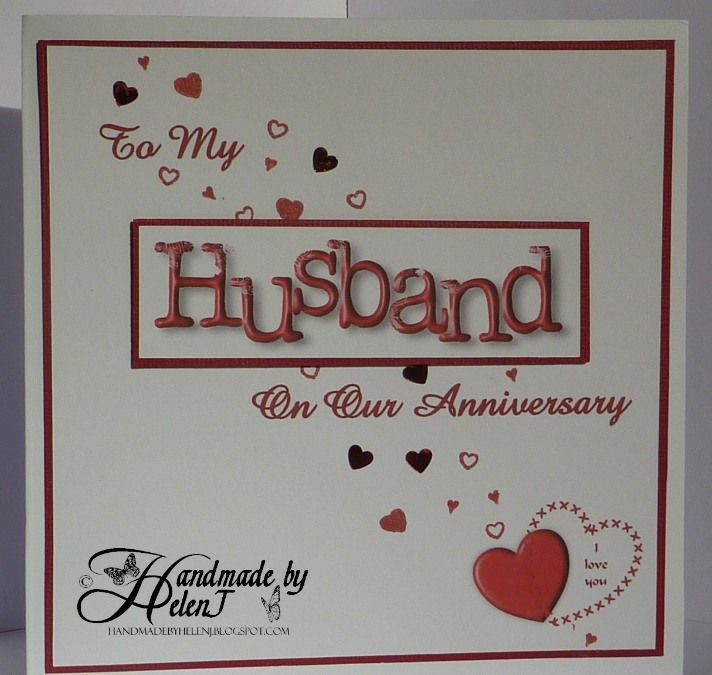 The word Husband is raised on foam pads. 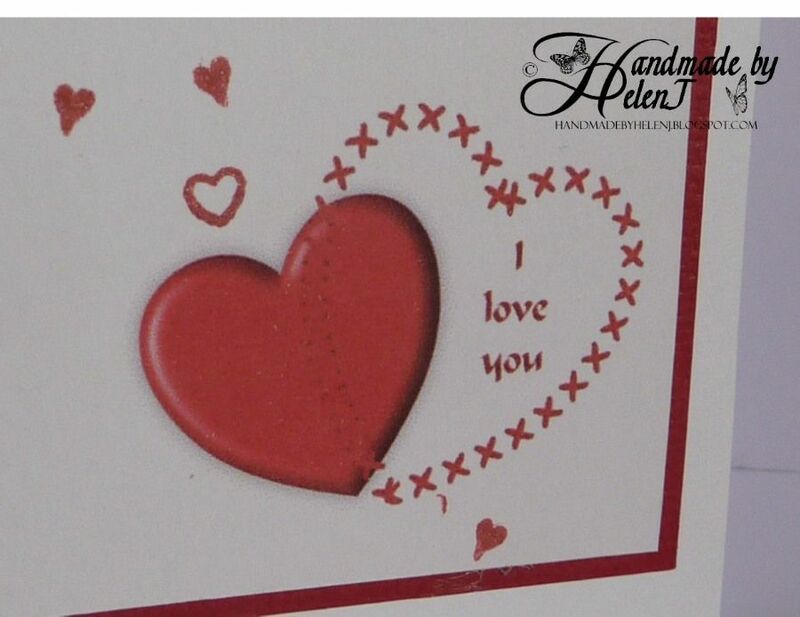 Word art created in Craft Artist Professional; various stamps used, cardstock from stash.